The day was beautiful. It was a little hot, but a breeze blew much of the time. My son and I constructed two large raised beds gardens. They measure 5 feet by 24 feet, by thirty inches deep. It will make gardening much easier in my advanced age. In the meantime, they will be home to our strawberry patch. The idea came to me this year while picking strawberries. The idea clobbered me once again while picking green beans. I am not sure if it was my head or my back that screamed the loudest, but I got the message just the same. No more bending over, practically standing on your head to pick vegetables and small fruits. I chose the width of five feet so that we can easily reach into the rows. We can get two rows per bed, planted the twenty-four feet way. That will make plenty of strawberries for us. The other bed will be for green beans, salad vegetables, herbs,carrots and onions. I think we will plant them the short way in five feet rows, with adequate spacing between those rows. Every two years we will switch the beds, enabling us to rotate crops as part of our sustainable approach to gardening. Some purest will wince that I used treated lumber for my bed frames, but I am not too worried. We don’t scrape the sides or eat the wood so shame on my indifference, but I couldn’t find any locust lumber for the purpose. I didn’t want to wait any longer to build the beds, so we went with what was available. I filled the beds with two feet of composted animal manure. Then I put eight to twelve inches of topsoil on the top layer. We will cover the whole thing with plastic and let the sun kill the weeds, then plant a cover crop that will stay on all winter, effectively putting the gardens to bed for the winter. I have all sorts of plans for our new beds. I think row covers will help us get off and growing much sooner in the spring. Moisture should be no problem and the soil should warm up faster too. I think this will be a fun experiment and a great new way to provide for our family. My son and I got lots of help from my grandchildren, but we built them both in one day anyway 😮 The kids had fun playing, driving nails in an old board, playing with the puppy and just being outside working with the family. Lunchtime came ,we cooked on the grill and had a small picnic. The breeze kept the flies away as we shared food and conversation. The whole day was pleasant. The work went well. My son took charge and did an awesome job with cutting, fitting and nailing. These last few days, Connie and I have accomplished many things on our to-do list. The garden beds are done, the new patio flower beds are all built and the planting is underway. We split a bunch of perennials and planted them on the south border of the garden. Those beds had to be built as well. I guess some would say that I have only been playing in the dirt. I think they are right, but man does it tire a guy out! The ODOT guys finished the ditch cleaning today. I stopped counting dump trucks when we got to 100. The steep slope at the back pond is looking better. Once the dirt dries out some, we can push it around and make it look nice. Talk about a green project! We used the waste soil for what will become a partial pasture. It is also green because it is full of cattail, sod and green beer bottles 😮 Hey I know about this stuff … I have been playing in the dirt for over fifty years! Today the area school children started back to school. Summer is over for them. They will still fill the evening air with playful shrieks and squeals as they squeeze every last drop of summer out of the calendar, but the summer daze have come to a close. I remember playing after school. It always seemed like it was just a tease. Once homework was done and chores were done, it was almost time to get a bath and head for bed. There wasn’t enough time for a walk in the woods, a game of kickball or much of anything, but I stayed outside anyway, right until dark. Today was a very busy day. The Ohio Department of Transportation is finally cleaning our roadside ditch. I am keeping all the sloppy mud and dirt to use near the sugarhouse. I am filling in a ravine created when we put the back pond in. 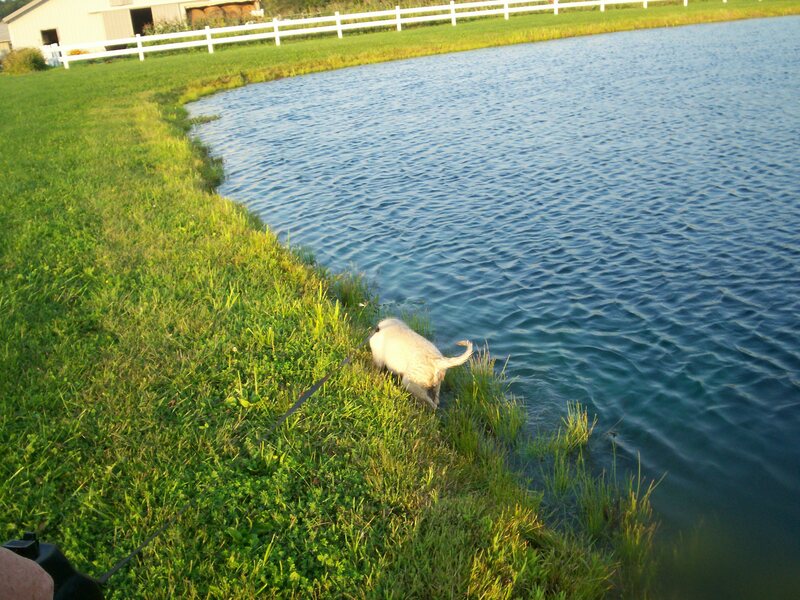 The banks are way too steep to mow and even the sheep balk at going up or down it. The gleanings from the ditch will make a great start to a sort of ramp. I have a great vision, we’ll see how it all works out. Right now it is a mess of mud, cattails, trash and Lord knows what else. I have been using a small rented bulldozer to push the dirt over the edge. It has gone well so far. I didn’t get stuck or tip it over so I say it has been successful! Man would I have loved to play on a bulldozer after school when I was a kid. It would have been awesome! Of course mom would have never let me, I could hear her sighing loudly today, when she thought I was too close to the edge. Summer daze are almost over for me too. 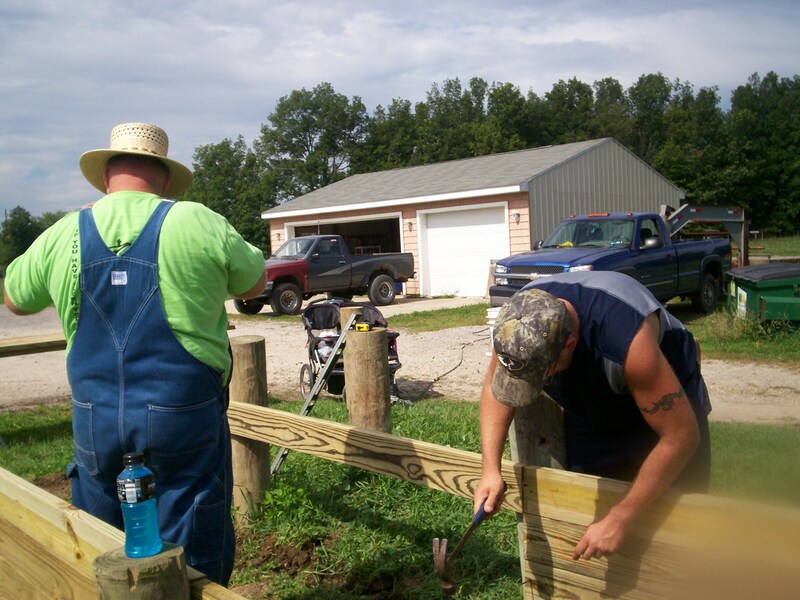 I am working as hard as I can to complete projects that require dry weather and hard ground. I should make a little more hay, but have been working over the hill at the sugarhouse, building new flowerbeds and tomorrow I hope to complete a couple raised bed gardens. My summer daze are crazy … but there is no way that I would call them …………. LAZY! Josh and John … they’re not just fishing. My son was teaching my 2-year old grandson how to fish. They have been fishing since the little guy could walk. That time is very special for them and one only has to look to see it. My son has a great deal of patience and stays very cool and calm, no matter how many times my grandson reels in the hook and bobber, empty of fish. Josh will cast the line out across the pond and hand the pole to John. The little fellow is sure that he has a fish on almost immediately. “I got one daddy!”, he’ll exclaim. He then starts reeling in the line, often before Josh can get his own pole in the water. My son will calmly say, “No you don’t. Watch the bobber.” John, however, reels in his “catch” just like Hemingway’s, “Old man of the sea”. The scene played out over and over the other day. I watched from the shore with a glad heart. I am not sure where my son got all his patience, but I hope he got the “how to be a good daddy part”, from me. Sometimes I worry that I wasn’t there enough as my boys grew up, but I can see that Josh understands just how precious time truly is and is making the most of it. I remember things that my dad showed me, just as I remember things that other men took the time to teach. I am ever grateful for them to have taken their time to share a moment with me. Those minutes in time, when I asked a thousand questions, when I did it all wrong and when I needed their help, are much of what shaped me to be what I am. I hope that I pass on those treasured gifts to the ones I meet and share life with. My grandson hunkers down and watches his daddy. He takes his fishing pole beaming with pride and fishes as if his life depends upon it. My son talks softly to his children as they fish alongside of him. 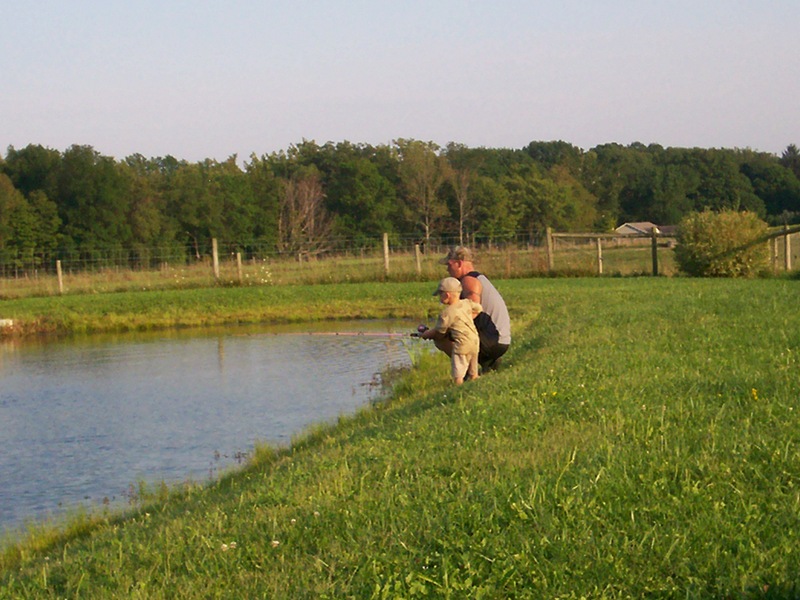 They are bonding at the deepest level and just think they are fishing in Pa-Pa’s pond. 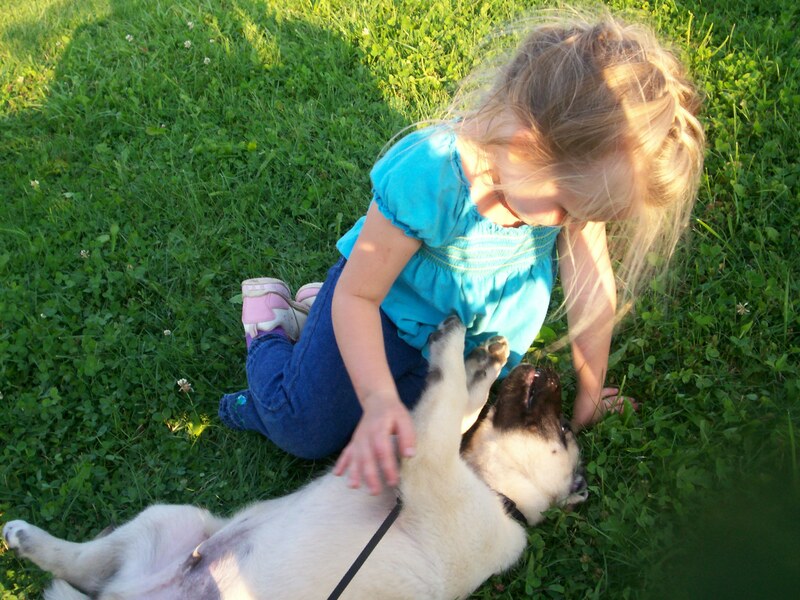 Our puppy King is sure smitten with our granddaughter. They played for quite a while. He was a gentleman most of the time … he is still a puppy. They raced and chased a bit. I am sure that both of them will sleep good tonight. King is doing great. He is housebreaking himself practically. He is without question, the easiest pup I have ever had to train. I thought that there couldn’t be a smarter dog than our old dog Lucy, but King may just be her equal. He is now nine weeks old. He is housebroken, leash trained, sits and even fetches already. I am looking forward to having him for a pal. Connie and I picked up a new hay mower to be used with our horses. I hope to get it assembled and tried out as quickly as possible. The hay is ready, we just have to wait on the weather a little bit. I am sure I will blog about the mower very soon. Great day again in northeast Ohio. The garden is doing great. The pastures are staying lush and green. The field corn is unbelievable. I will take a picture on September 4th to show what another 30 days of growing has done. I spent the day with family here on the farm, with everything I love, close by or on my mind. Yep, it was a great day! 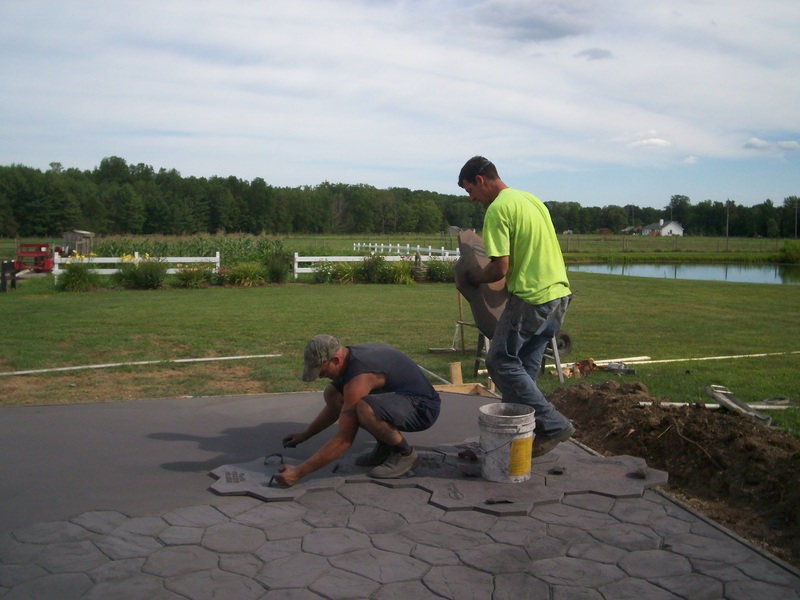 My son and his buddy stamped the concrete for our new patio. The design resembles river rock or field stone. It makes a pretty design and is colored to add to its mystic. They did a good job and my wife is very happy. The cement will out last me for sure. The design will stand for all to see for a very long time. Just as the designs in the concrete have texture and shape, the memories in my mind make marks on my heart. I have memories of family and friends that are locked away only to be viewed when something triggers my heart. It’s funny to me how my heart can talk to my mind and visa-versa. A song on the radio can take me back many years, as can a smell or touch. My senses come alive when I take time to listen to them. The creak of my horses harness will often remind me of grandpa. The small bells on their harness cause me to think of an old friend who got me started with draft horses. I bet the scars on my heart from all those wonderful marks would scare some people, but I wear them as a badge of honor. I am so very blessed to have been loved by so many people. These are people who care enough to love until it hurts… it is a love tried and true. I have marks made by the pain of love too. First love, failed love and just plain rejection can make an awful sting. The pain lasts a lifetime, but makes the good love even better. So, it is with bittersweet emotion that I remember some of those pains and thank God for them too. The newest engravings on my heart come from our youngest grandchildren. They line up with ones from grandkids who came before. They won my heart, filled my life and touched my soul. The best part of all is, that I have given them memories to cherish and marks on their own hearts. Those designs will last for many generations as they share their love for me, just as I share the love from my grandparents and those who have gone before. The patio was completed by two friends, my son and his pal. I helped raise them both. I know that I left a mark on them now and then, we laugh about many of them. They were the product of a time-tested model, as were the rest of my boys. I helped to grow men as hard as concrete, with enough marks on their hearts to hold a kitten, change a diaper and other than that , take no crap from anybody… and I am proud of every one of them! This painting was done by a lady that I used to work with. She painted it from a photograph. 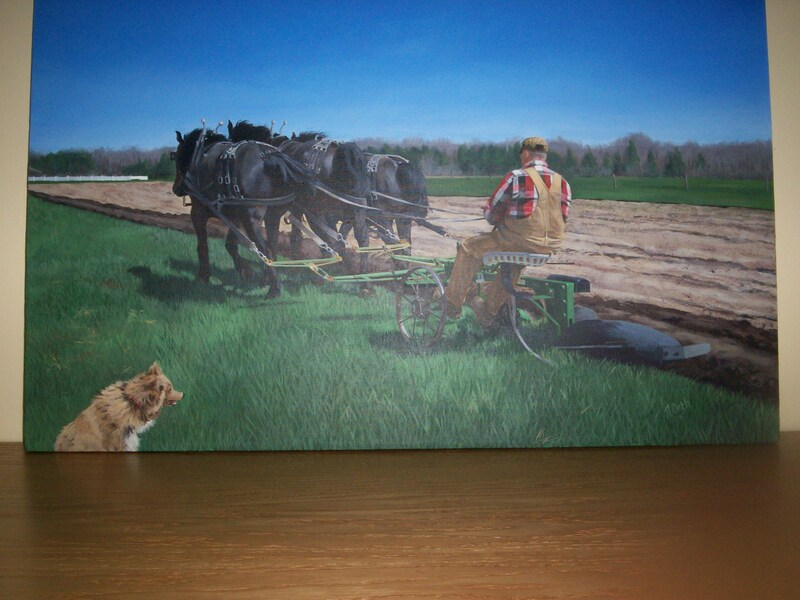 My dog in the photo died while she was painting the picture of me plowing. She had never seen the dog alive. She drew the dog into the painting from a different picture. The details in the painting are spot on. I am in amazement that anyone has this kind of talent. Thank you Nancy, for a picture worth well beyond a thousand words. The painting will go above our fireplace mantle on the wall. It has already had many nice comments. I have to study it every time I walk by it myself. It is beautiful and very well done. It makes a great addition to our home. I broke a Percheron mare for a lady who lives down state. I have had the young horse in my care for quite a while. I delivered her home yesterday. The horse and lady were reunited. The horse has a very good home and will be spoiled rotten. I think they will enjoy each other for years to come. We are now down to three geldings. They match well. They are broke to all my farm equipment and will still leave me with plenty of “horse” power. I will move them to the original horse barn built just for them. I had six horses this spring, but have downsized to the three that I want and need. Summer still has some nice days to enjoy. The fields are once again lush green. The livestock is very content as they munch on the tender grasses. My list is getting a little shorter, thanks in part to those around me, who help get the work done. I even get a few minutes each day to enjoy this farm and its views… and believe me, there are several that are worth a thousand words! We were discussing getting “King” a few weeks before Lucy (our Border Collie) got sick. We had no idea that she would soon be leaving our farm and this life. We had hoped that Lucy would help King learn the ropes around here. She could have taught him the boundaries, both personal and property. She would have been an awesome teacher. “King” came to us from breeders here in Ohio. The folks at Flying W Farms were very informative and helpful. 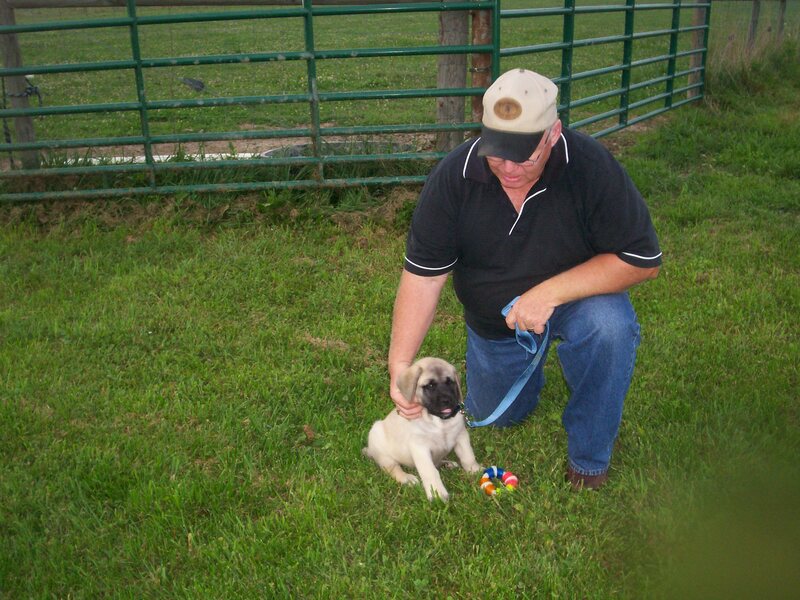 We are now the proud owners of an American Mastiff. A blurb on their website says, “The Lion is to the cat, what the Mastiff is to the dog.” I can see exactly what they mean. These are some large, intelligent animals. Our Lucy could not be replaced by another Border Collie. I would have expected way too much from the new puppy. Lucy was smarter than any dog I have ever owned. She could almost read my mind. I don’t know how she did it. I will say that she loved me until the minute she died, with unfailing devotion. I will miss her for the rest of my life. She watches the farm from the corner of our garden, where she rests under the shade of two fire bushes, planted just for her. I think I have done ok with clumsy , sloppy boys. I know that I have had direct influence in four who are now great men. I have touched the lives of several others who likewise are good men. I think I can get this little guy to become a productive part of our farm too. He will protect us, love us and be my constant companion. I look forward to the next several years and the journey that he and I will share.